In the national identity stakes, there’s pretty much nothing more insulting as a South African than being mistaken for an Australian, and probably nothing more insulting to an Australian than being mistaken for a South African. There are many similarities between our two cultures so it’s easy to see why people confuse us Saffas with you Aussies. But there are just as many stark differences. Howzit is synonymous with South Africans. It’s the perfect greeting for any occasion, whether you’re meeting a long lost friend, a complete stranger or even in a business setting. To a Saffa this means how you are physically getting to somewhere. I actually know someone who replied to this greeting by saying: “I took the train”. Ask any South African what they had on toast growing up and Marmite is bound to feature on their list. But in Australia, there is something very different… Vegemite. Some people might think they’re the same. But they are not. Definitely not. Rugby and cricket are two of the most loved sports in South Africa. Growing up in South Africa, you’re led to believe that it’s the same in Australia due to the massive sporting rivalry between the two countries. But when I arrived in Australia, I was shocked at just how little these two sports feature in the average Australian’s life. Everything in Australia is centred around AFL, or footy as it’s called here. After that, rugby league is pretty big. Rugby union, as you call it down under, and cricket are way down the sporting pecking order in Australia. And don’t ever make the mistake of referring to soccer as football or footy when talking to an Australian, they just get too confused, poor dears. OK, this one applies to the whole world, as almost everyone except us South Africans refer to a good ild ‘braai’ as a ‘barbeque’. We Saffas might do the same things around the braai but if it’s not called a braai, it’s not a braai. And it’s definitely not a braai if it’s on gas! We get that there are bushfires and total fire bans in summer, but it’s just not the same as having that flame grilled taste on everything. Every South African has surely been on the back of a bakkie at some point. Whether it was flying down the highway in the pre-safety days with the wind in your hair, or bumping along a dirt road in the bush somewhere trying not to fall out. There’s something awesome about the word. Bakkie. It just sounds so solid and trustworthy. Nothing beats a holiday in the bush in South Africa. The smell, the sounds, the animals, it’s simply intoxicating. In Australia, the outback is generally avoided and contains miles and miles of NOTHING. Well, maybe some kangaroos, dingoes and a lot of dirt. Hardly a drawcard for a holiday. Think ‘Out Of Africa’ vs ‘Wolf Creek’. I know what I would pick! It seems the Aussies like to change their prime minister about as often as they change their underwear. In the total time Jacob Zuma has been ‘president’, Australia has seen five different prime ministers (technically Kevin Rudd served twice but in two different periods). It’s almost impossible to keep up with the changes! So just ask if someone knows who their country’s leader is. If they have no idea, they’re probably Australian. This is a no-brainer. Just check out what someone is drinking to determine their nationality. 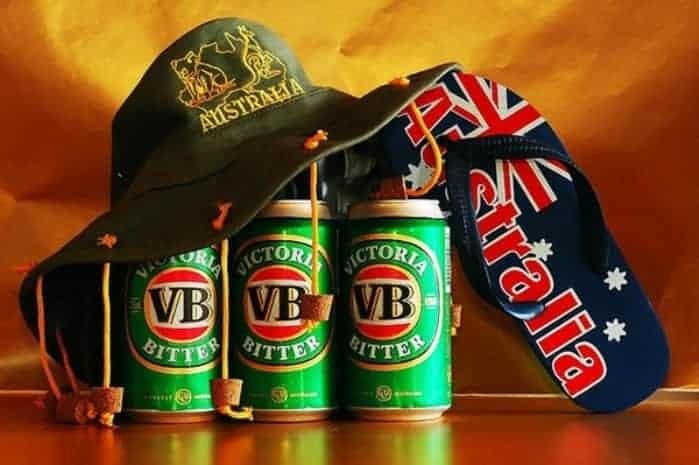 No South African with any sense of national pride would be caught dead drinking VB, Toohey’s or any of those so-called ‘beers’ they make Down Under. Give us an ice cold Castle, Carling Black Label or Windhoek anytime! In Australia, they like to shorten everything! I’ve come to the conclusion the Aussies are so laid back they can’t even be bothered to say whole words. And when they shorten their words, everything gets an ‘o’ at the end. Ambo (ambulance), servo (service/petrol station), bottle-o (bottle store), arvo (afternoon), doco (documentary), journo (journalist), Freo (Fremantle). You name any word, shorten it and stick an ‘o’ on the end, and you’ll blend seamlessly into a group of Aussies. In South Africa on the other hand, we make everything sound cute by ending it with ‘ie’ or ‘jie’ to the end. Boytjie, laaitie, ballie, stompie, bakkie, takkies. So, even if you can’t tell us apart by our accents (you heathens! ), listen to the words we’re using and you’ll soon figure it out. Coffee in Australia is a whole other ball game. The Aussies are complete coffee snobs and everyone claims to know where they have had the best/worst/cheapest/most expensive cup of coffee in their city. Most café menus in Australia will feature these in their hot drinks menu: short black, long black, flat white, latte, piccolo latte, chai latte, espresso, double espresso, doppio, short macchiato, long macchiato…the list is endless. Kids even get babycinos! Seriously, it’s just hot milk with froth but no, it’s a babycino. I think secretly the Aussies wish they were Italian! In South Africa, it’s usually coffee, cappuccino, café latte and espresso. So all you Brits and Americans out there, the next time the person next to you sounds South African but asks for a long black with an extra shot and some hot milk on the side, you can pretty much assume they’re actually an Aussie.